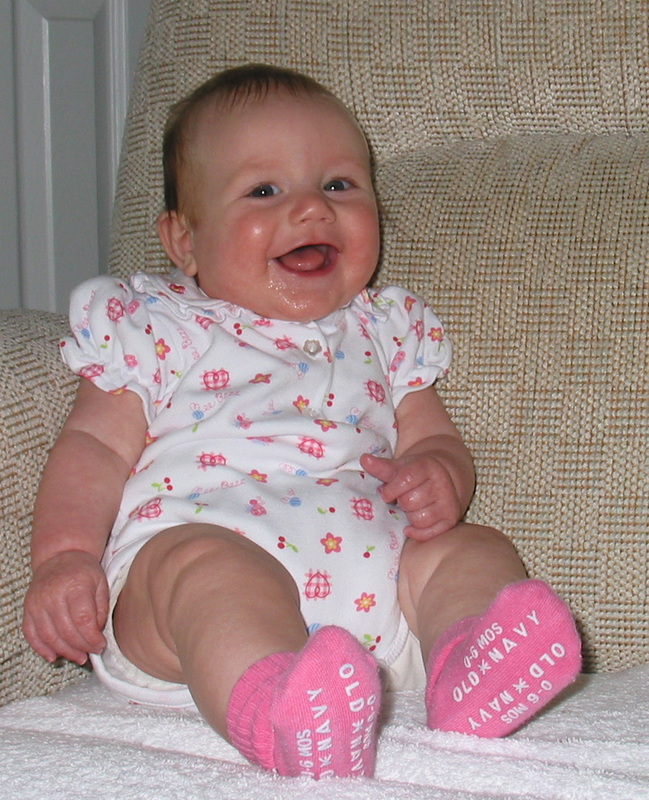 Chloe at 4 months – how could anyone be mean to this baby? I was reading Best for Babes’ recent post about moms being hassled or ejected from various venues for breastfeeding. They mention an incident at a Charlotte YMCA, and go on to note that through the years different Ys throughout the country have put the kibosh on nursing in public. It vividly reminded me of my own incident at a Y, which still makes me a little angry after all these years, but which also illustrates how much progress we’ve made. As a new member of the Lakewood YMCA and a breastfeeding mother, I would like to know whether your organization has an explicit policy supporting breastfeeding. I ask this question because of an unfortunate incident during one of my recent visits to the Lakewood facility. I was nursing my daughter in the lobby area when a staff member approached me and asked me to “do that somewhere else.” She expressed particular concern that the high school students would see us, and specifically said it would only be acceptable for me to feed my baby where “no one can see you.” She suggested the locker room. To me, this directive displayed a hostile and fearful attitude toward breastfeeding, treating it as though it were something dirty or perverse, something children shouldn’t be exposed to. I hope that this is not reflective of the YMCA’s official position on breastfeeding. As you may be aware, the American Academy of Pediatrics recommends that mothers breastfeed their babies during the first year of life, for optimum health and development. As an organization that promotes health and family closeness, I hope that the YMCA would encourage and support breastfeeding to the greatest extent possible. If no such supportive policy is in place, I urge you to implement one. If, on the other hand, my recent experience is indicative of your current policy, I ask that you reconsider your position. Breastfeeding mothers are doing the best thing for their babies, and they need sympathy and encouragement. Breastfeeding can be a big challenge, and the last thing nursing mothers need is an implicit message that their behavior is somehow deviant and not fit to be seen in public. Thank you for your attention. I look forward to hearing from you regarding this issue. Guess what I heard back – bupkis. I never got any kind of response. And in those days, that was it. It never occurred to me to try to stage a nurse-in. That wasn’t even a thing yet, as far as I know! Nor did it come to mind to contact local media. No one cared enough for this to be news. I was just one mom, on my own. Today, as I read about the immediate community response to the Charlotte incident, and how that prompted the Y to listen and change its policies, I actually got a little misty, thinking of how much that would have meant to me at the time. No matter how confident, sassy, and assertive a person you are, I think when someone criticizes and evicts you over breastfeeding, you tend to feel extremely vulnerable. I’m so immensely proud and gladdened that breastfeeding mothers and their supporters have come together and lent their collective power to every mom who is harassed and shamed by the ignorant. Because of all of us making some noise about these things, it has even become a news event when a business kicks out a nursing mom. Things are getting better. Moms and babies are more protected. All of you out there standing up for mothers and babies, for nursing being normal, are making real progress. I just want to celebrate this, and remind everyone to keep up the good fight.